Some call it compass, some call it rounder, I call it absolutely breathtaking. Designed with a minimal appeal that one often doesn’t see in geometry tools, the Ballet is a beautifully simplistic compass (yes, that’s the technical term for it) that looks as beautiful as a uni-body metal pen. Milled to precision from what I reckon is aluminum, the Ballet is perfectly cylindrical, with a hint of a parting line running vertically down the center, giving you a compass that splits into two, pivoted near the top. The Balance also comes with two knobs, one to control the tightness of the pivot, and the other one to deploy and secure the graphite lead. The lead itself is an interesting detail too. Rather than have a separate lead and a needle, the Ballet merges the two together, almost how ballerinas’ feet look when they’re posing on their tip-toes. The detail right at the bottom is singular, and is half needle, half lead. Open the compass out and the two separate, becoming two individual volumes, just like the compass’ legs! “What we experience, and what we remember about what we’ve experienced are two totally different things.” – Jeremy Finch. That’s what the Twist Pen is all about. Creating a UX that’s so good it instantly gets etched in one’s memory. Whether it’s the pen’s satisfying twist-and-click actuation, or the textures around the grip and the twisting knobs, or even the pen’s weighted, cool metallic feel. The Twist is a modern classic. It isn’t edgy, it doesn’t over-innovate, and it isn’t disposable. It’s the kind of pen you’ll use for years, only because it’s the kind of pen your hands will love to hold and your brain will undeniably get used to. The Twist Pen is precisely machined from an aerospace-grade metal stock, and is then given a DLC (Diamond-like Carbon) coating to enhance its strength and resistance to scuffs, scratches, or abrasions. Available in Brass, Stainless Steel, and Black DLC, the pen feels well-weighted with a balanced center of mass, and was made to be extremely durable and resistant to abrasions. It features a simple, easy to use design, with a textured metal grip that your fingers instantly get used to, and a twist-to-open mechanism on the top that turns with a satisfying click to expose or withdraw the pen’s tip. The Twist comes included with an Itoya Aqua Roller gel refill, and is designed to be compatible with all Parker-style or G2 refills. It even includes the classic pocket clip (with a recessed clip locator) allowing you to easily whip out and holster your pen whenever needed. Every aspect of the Twist was designed to be the best version of itself. The pen’s build is robust and durable yet comfortable, and features a balanced center of mass that makes writing with it truly comfortable. The metal body also packs a neat patterned grip that makes the pen easy to write with, and a refill that provides a buttery smooth writing experience. Lastly, the pen’s twist-action-mechanism is engineered and machined to perfection. With absolutely tight tolerances and a smooth tactile experience that ends with a simple, satisfying click, the Twist’s user experience isn’t something you can possibly ignore (even visually, with that anodized orange pop!). Its design is simple yet impactful and memorable, and it clearly isn’t designed to be a product only for your eyes. Even in your hands, the Twist is designed to have a memorable UX… and who’s to say that twist-to-open mechanism won’t become a fidget toy in your hands?! Click Here To Buy Now: $65. Hurry, less than 48 hours left and free shipping within the US! The Field Pen Line: The Twist. It’s the first design by Machine Era that incorporates Parker size refills. The fully machined body is integrated with tactile details, smooth ‘lock in’ action, and an effortless gel writer from Itoya. What Is DLC – Diamond-Like Carbon (DLC) is a type of PVD coating, it’s impact resistant, and almost impossible to scratch. DLC coatings are used in sectors that require highly precise and extremely durable components – it’s commonly used in performance racing, aircraft, firearm, and fine watch industries. Ink: After running through many different Parker size ink cartridges, the team has settled on the Itoya Aquaroller as the best choice for this writing tool. The 0.7mm acid free gel ink flows onto your writing surface like no other. It’s very reliable, and starts flowing as soon as it hits the paper. No scribbling to get it going. Made in Japan. By using Swiss-type turning techniques, Adam & Ryan are able to deliver parts that are extremely accurate – tolerances usually reserved for medical and aerospace industries. Moleskine’s paper notebook lets you draw in vectors right inside Adobe Illustrator! Teaming up together to achieve the near impossible, Adobe and Moleskine have debuted the Paper Tablet, a book and pen combo that translates sketches on paper to digital sketches on Adobe’s software… but that’s not all. The sketches you make on Moleskine’s Paper Tablet don’t just appear as scanned images on your computer. They get vectorized within Adobe Illustrator, giving you an infinite set of possibilities to take your doodles and actually begin working on them in vector software. The magic happens courtesy Moleskine’s Adobe Creative Cloud Connected Paper Tablet (the notebook), and the Moleskine Pen+ Ellipse pen. The notebook comes with Adobe’s Illustrator icon at the top right of each page, and simply tapping on it with the Pen+ Ellipse lets you save all your progress to Adobe’s Creative Cloud. Once you begin sketching on Moleskine’s special notebook, the Pen+ records each movement, copying each stroke to Adobe Illustrator in real time, although you can sketch independently without having Adobe Illustrator open too. With a simple Adobe extension, you can beam all your progress to Illustrator and sketch in real-time should you choose. You can even undo actions and brush strokes on the digital file (although that won’t happen on paper). Essentially replacing the need for a Wacom, while providing integration with Adobe’s Illustrator to remove all sorts of friction, Moleskine’s Paper Tablet is a neat way to take your doodles and sketches to the next level while retaining the comfort of drawing on paper. 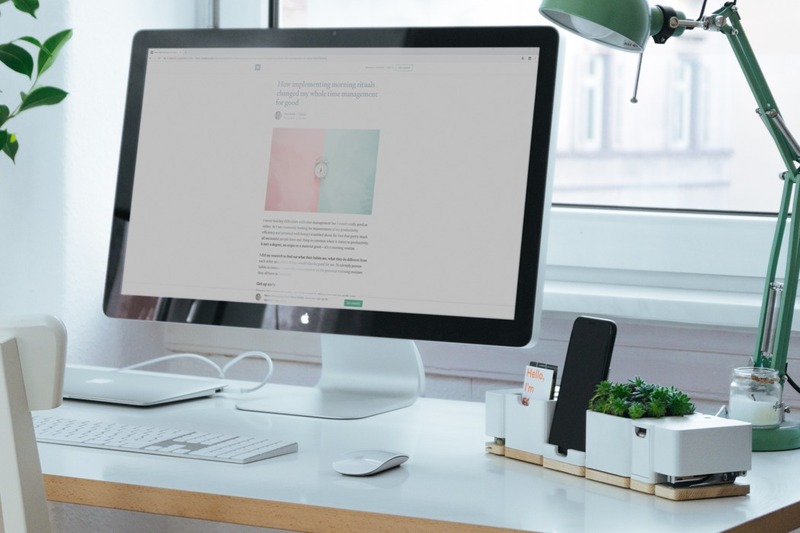 Throughout the working day, our desks can become cluttered and deeply unorganized messes that limit our potential through creating distractions and reducing efficiency. This is only made worse by the abundance of cables that weave around our desks. 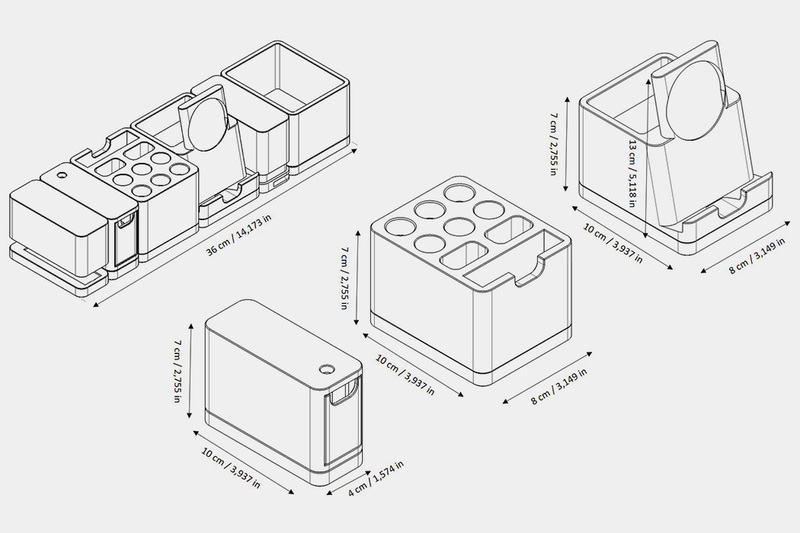 We need something that contains all the essential items and places them within one organized location. 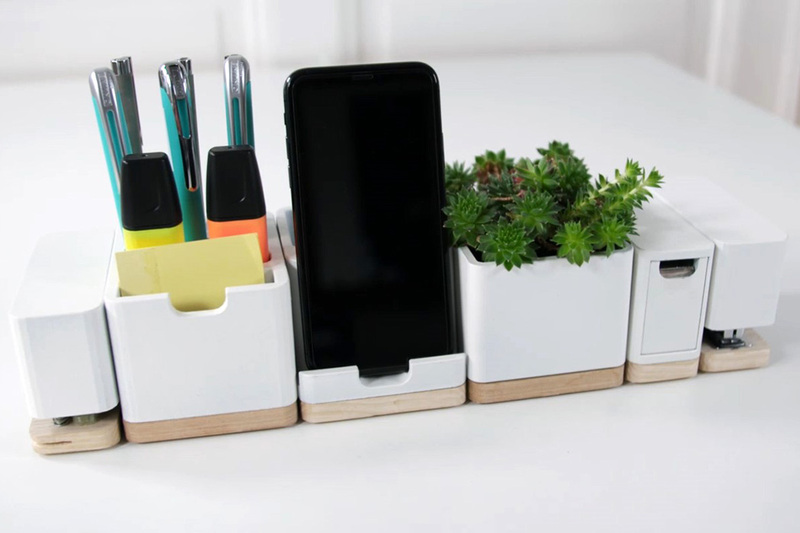 The Stealtho Desk organizer is here to do just that; It carries an array of features that keep everything you need in one tidy place! 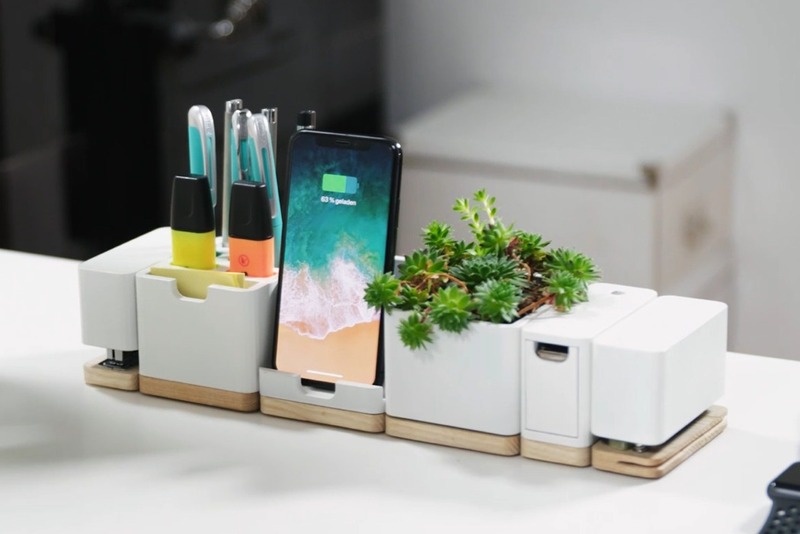 Stealtho is the combination of both a humble desk organizer and Qi Wireless charger. This allows for easy access to essential writing equipment, whilst your phone can be simultaneously charged on the upright stand. With Stealtho, annoying dongles are a thing of the past; built-in to its base is a USB hub that enables efficient data-transfer or the charging of mobile devices. This is certainly a productivity-increasing desk accessory that is packed full of functions to make your working day pass-by as smoothly as possible. Click Here To Buy Now: $99 $180 (45% off). Hurry, less than 24 hours left! 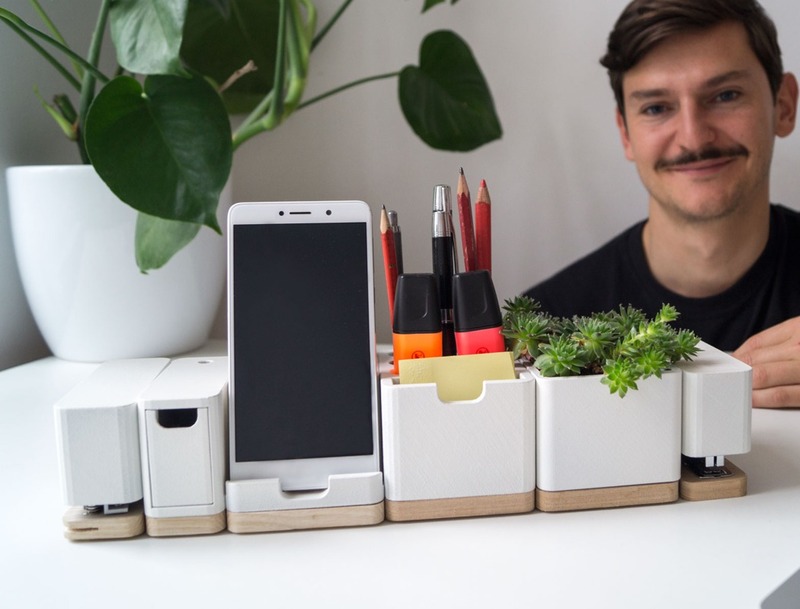 The Stealtho is a 12-in-1 modular desk organizer that pulls everything you require into a single, customizable and more functional location. The first thing they combined was a desktop organizer and Qi Wireless Charger. This component gives you an easily accessible station for pens, markers, pencils and more, all while serving as a convenient charging station for your phone. Their wireless charger is based on the Qi standard 10w output, which makes it compatible with a large range of Apple, Samsung, Sony, Nokia and other devices. Get rid of wires and adapters for your MacBook, Air and Pro and save some cash! 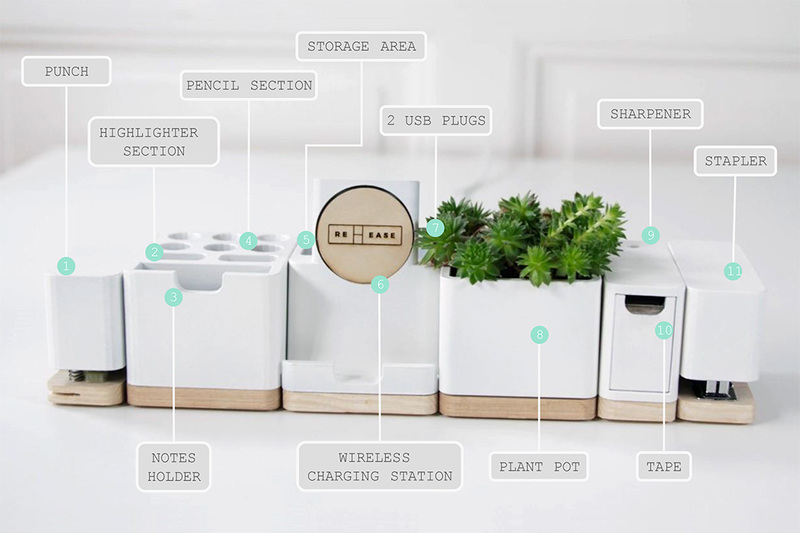 Built into the utensil organizer and charger component is a USB hub. The hub allows you to quickly charge your tablet, laptop and power bank, and to use USB flash drives. You also can read micro SD cards from other devices, getting the data directly to your computer for your projects. The standard HDMI 2.0 port brings you the best in audio/visual quality. The complete 12-in-1 STEALTHO organizer includes the following on the USB hub: 2 x USB3.0; 2 x USB type C; micro SD card reader; HDMI 2.0. The tilt of the charging station is designed to give you the perfect viewing angle for device screens, making hands-free communication on popular platforms like Skype physically easier and more enticing. No more being distracted by an achy neck or grip! Non-slip and non-scratching magnetic base. 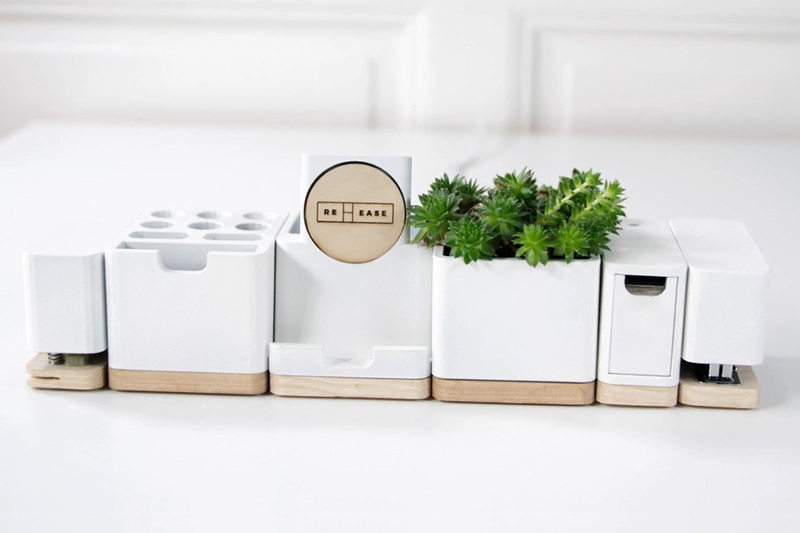 A snap-and-fit style design that allows you to rearrange each piece of the organizer. When your mobile phone is already charged, you can use the charging pad as a quick notes and writing board. The sticky notes stand is also multifunctional. Use it as a copyholder to keep documents at the ready for reference. If you’re a music lover or just need some white noise to concentrate, use the stand to hold a pair of high-quality headphones. Need a place to hold pushpins, paper clips and other small supplies? The sticky notes holder offers the perfect tray. The other side features four slots for your most valuable business cards, money or similar items. Great idea? Need to remember a fact? The Post-it holder means paper is always there when you need it. If stickies aren’t your style, use this space to hold keys, earbuds or other items. This year is, for all intents and purposes, the year of the retro wave. The Moto Razr is relaunching, Disney is practically remaking all their glorious movies, and nixie tubes may just be making a full comeback too! The use of Nixie tubes dates back to the 50s, being used as light-up numeric indicators in various technical equipments. These tubes were hand-crafted, and required a great deal of technical expertise to manufacture. Needless to say, the tubes were soon replaced by flipboard displays, and then eventually pixels. The Nixie Tube still remains a lovable piece of technology that is reminiscent of a time when things were made by hand, and adored for its steampunk aesthetic. The ZIN18 Reborn Clock is a modern-day throwback to that time. Designed by the designers and craftsmen at Millclock Company, the ZIN18 Reborn is a six-tube clock that features Millclock Company’s ZIN18 nixie tubes. These tubes are crafted entirely by hand, and use better materials and manufacturing processes than the tubes made half a century ago. They also run on incredibly low energy. A delightful combination of old and new, the ZIN18 Reborn Clock does a hat-tip to the 70-year-old nixie technology while remaining a pretty sophisticated clock in its own right. It can be controlled via a smartphone app, and even features a touch-sensitive control panel to set the time. The clock has the ability to synchronize its timekeeping via the internet, and even features an alarm! The ZIN18 Reborn clock comes with a polished metal base and 6 individual nixie tubes that can be fitted into their individual housings. To protect these tubes from dislodging, or any accidental nudging, the clock comes with a glass hood that encases all six tubes, giving you a clear view of the time while also indicating the precious quality of these expertly handcrafted tubes. Nixie tubes today are hard to find, given that nobody mass-produces them anymore, especially since they’re incredibly difficult to manufacture and require a skilled hand. Determined to bring this heartwarming piece of technology back, Millclock Company is working to evolve the craft, resulting in tubes that are stronger, safer, and have a lifespan of as long as 20 years of continuous usage. The ZIN18 tubes boast of the craftsmanship one would expect from a jeweler or a watchmaker, and the company also plans to make these tubes readily available to hobbyists and designers who want to use these tubes for their own projects in the future. Click Here to Buy Now: $97. Hurry, less than 72 hours left! ZIN18 is a modernized and most compact Nixie tube that has been produced. These tubes are crafted entirely by hand, and use better materials and manufacturing processes than the tubes made half a century ago. They also run on incredibly low energy. The Reborn ZIN18 Nixie clock works for about 20 years or 200.000 hours of uninterrupted time-telling, 24/7. Determined to bring this heartwarming piece of technology back, Millclock Company is working to evolve the craft, resulting in tubes that are stronger, safer, and have a lifespan of as long as 20 years of continuous usage. Conceptually, the name ZIN is a blend of the Z class and IN class Nixie tubes. The design of transformation of two classes into one new variety took us profound research and hard work. The Millclock team modernized a beautiful base that is used in the Z class lamps. Then, they elongated a small IN18 Nixie tube, by only 44mm and mount it on the base. The team manually assembles 47 best quality components of the envelope. Then, they create the glass tube and the thread in special machines and put the whole piece in the “ovens” with temperatures more than 600 degrees Celsius. Next, the team anneal’s it and infuses the mixture of pure gasses, and finally test it on the stand. This process results in a highly strengthened glass of the tube and leak-free seal at the bottom part of the lamp. And those are the two main check points of the tube’s long service time. Reborn ZIN18 tubes are available with three varieties of bases to meet your aesthetic vision in projects making: polished aluminum, black anodized and sand blasted aluminum. In ZIN18, the cathode digits can be easily programmed to show exact time and other valuable data. The digits can run diverse visual effects. They can slowly slide or quickly switch with adjustable speed that looks phantasmagorical, especially in the dark premises. To create a mood-light effect at home, you can switch on the under lighting. The software allows for a vast range of colors and visual effects of under lighting that can create any mood in your home – party, romantic or relaxing. ZIN18 Nixie clock works via Android and Apple iOS, it also supports censor communication through the embedded touch pad. The manufacturing of this beautiful nixie equals to art-making, as making mechanical clocks, perfume, or gem jewelry. The process is quite intricate but mesmerizing and has the following milestones. It’s hard to keep track of all the features the Magcon has and all the problems the Magcon solves, but I’ll try my level best to stay on top of things in this article. This is the Magcon. It’s an artist’s, engineer’s, designer’s, architect’s, student’s, and general human’s best friend. The Magcon isn’t just a stationery tool, it’s a real tool too. It packs a pen-stand, rounder/compass, wrench, scale, bottle opener, and drawing guide all in one. There are two very clear ways of looking at the Magcon. It serves the purpose of a drawing tool, and it also works as an EDC tool. The Magcon comprises two utility modules, a straight ruler with linear perforations, and a second abstract ruler with a curved profile, drawing guides, a set of wrenches, and a bottle opener. These modules can be used independently as you would a scale or a french curve ruler, but things get more interesting when you introduce Magcon’s Compass base to the mix. The Compass is a solid piece of machined stainless steel that works not just as a compass-guide, but also as a pen-stand. It has a hole at its base that you can use to place the Compass wherever you need, and magnetically allows the ruler units to snap to it. Once magnetically attached, the ruler units swing freely in 360° around the base, allowing you to create circles and measure arcs nearly perfectly, while achieving this feat without piercing the paper. Markings on the Compass base even let you measure degrees as you draw circular lines, giving you control and intuition, bundled together in tools that don’t change the way you make circles or lines, but just innovatively improve the process and cut the clutter, thanks to its minimal design. There’s a lot the Magcon can do. It can let you make perfect lines, arcs, circles, measure drawings, make mandala patterns, and even let you rest your pen/pencil in it when you’re taking a break. In fact, it’ll do you another solid and let you open a nice bottle of soda while you’re on that break! Click Here to Buy Now: $50 (Full Set) $62.5 (20% off) Hurry! Free Global Shipping! Paper shredders have unfortunately found themselves falling into the category of ‘over-designed’ and ‘unnecessarily complicated’ products, with their often visually-complicated aesthetics jarring with their surroundings and their functionality getting lost beneath the unwanted functions. This is the exact issue that the team at Blond Design Studio identified, and their answer to the problem is Aperture. Aperture is an intriguing product, where functionality and simplicity have been at the forefront of the design. Just two buttons are present on the device, these being auto and reverse, making operation straightforward and hassle-free. A viewing window is absent from the clean, uninterrupted form, as this has instead been replaced with a viewing hole on the top of the device, meaning that the user does not have to awkwardly bend down to check the paper contents. The primary drive behind the fuss-free aesthetic was to create a product which can be integrated into a range of interior styles and sceneries… without standing out like a sore thumb! During their research they noticed that most paper shredders had a power cable which exits from the top of the product, as this is where the components are located. However, this cable position causes complications in terms of positioning, not to mention; it is aesthetically unpleasant. Due to this, they created a cable channel on the inside of the casing and relocated the power cable to the bottom of the product. In additional to the white CMF direction, supplementary colour pallets have been inspired by the woods used to make paper. Your laptop’s very own utility belt! Pardon the comparison, but Batman wouldn’t be half as effective if he carried all his equipment in a backpack, constantly opening it every time he needed a Batarang or that explosive gel/goo he so famously uses. It’s called a utility belt for the exact reason that it’s a belt that’s got an impressive feature list aside from just holding your pants up. Although laptops don’t have any pants, this scenario should feel extremely familiar. You’ve set your workspace up and begun work on your laptop, and a colleague pops in telling you to come to the conference room or your boss’s cabin for a quick presentation. You shut your laptop, effectively turning it into a tray that then carries your notebook, a pen, your mouse, your phone, and any other things you may need. It’s clumsy and sometimes the pen rolls off, or the mouse slides off the laptop’s smooth surface and plummets to the floor. You’re also left with no hands to carry your coffee because you’re balancing your laptop with two hands. For a product like the Blau to exist, you’d probably need to notice this glaring problem that most people conveniently internalize. The world is filled with small undesirable experiences like having to use your precious MacBook as a tray for your belongings, and it’s a good thing that people like the designers of Blau are perceptive and empathetic enough to deliver a solution that works remarkably. The Blau is your laptop’s utility belt. It straps to your laptop when closed, much like an elastic bookmark, and allows you to tuck your belongings into its many pockets. Phone, notebook, pen, pencil, mouse, the Blau’s slots hold anything you need, allowing you to carry all your work essentials by strapping them to your laptop. You can conveniently carry your laptop in one hand, and a beverage in the other. When taken off, the Blau serves as an organizer, standing upright and letting you stash things in it. However, the Blau isn’t a single product, but is rather a collection. Available in three styles across different sizes, the Blau comes in Fold, Slim, and Twist variants. The Fold forms the largest of the three, allowing you to store more, and even becomes a pretty reliable organizer when placed vertically on a desk. A minimal version of the Fold, the Slim lets you carry your essentials, from electronics to stationery, to perhaps even your glasses or earphones. It too, turns into an organizer when placed on a desk, allowing you to have all your products at arms reach, and giving you the convenience a laptop bag or sleeve would, but in a more sleek avatar. The sleekest of the three is the Twist, an elastic cord that stretches and wraps around your laptop, notebook, tablet, or even your desktop screen. The Twist may not have pockets or slots like the Fold and Slim, but it lends itself to more versatility. It features elastic slots that you can wedge your pens and pencils in, and even a flexible magnetic tag that you can dock your earphones against (or use to hold paper clips, perhaps). All of Blau’s organizational products are made from a resilient, stretchable fabric that’s lightweight, stain-resistant, and even washable. They come in grey and dark anthracite to suit your tastes, and are perfect because they neither a bag nor a backpack, neither a cover nor a sleeve. They are more flexible, light and convenient for the lifestyle of a digital nomad, and are uniquely fulfilling and enriching enough to create a category in their own right! Click Here To Buy Now: $44 $49 (10% off). Hurry, only 17 units left in stock! Blau offers smart solutions for digital nomads. It is the world’s first collection of portable organizers attachable to your devices! The Fold, The Slim and The Twist – The Fold allows you to store more, and even becomes a pretty reliable organizer when placed vertically on a desk. The Slim lets you carry your essentials, from electronics to stationery, to perhaps even your glasses or earphones. It too, turns into an organizer when placed on a desk. The Twist, an elastic cord that stretches and wraps around your laptop, notebook, tablet, or even your desktop screen. Fold, the biggest one of the family, but small enough to take it wherever you go! Simple and functional design to carry and organize the basic elements together attached to a laptop or notebook. It has space to store large items, those who you always have to use to work (mouse and charger), and another space to keep smaller items well organized and handy. 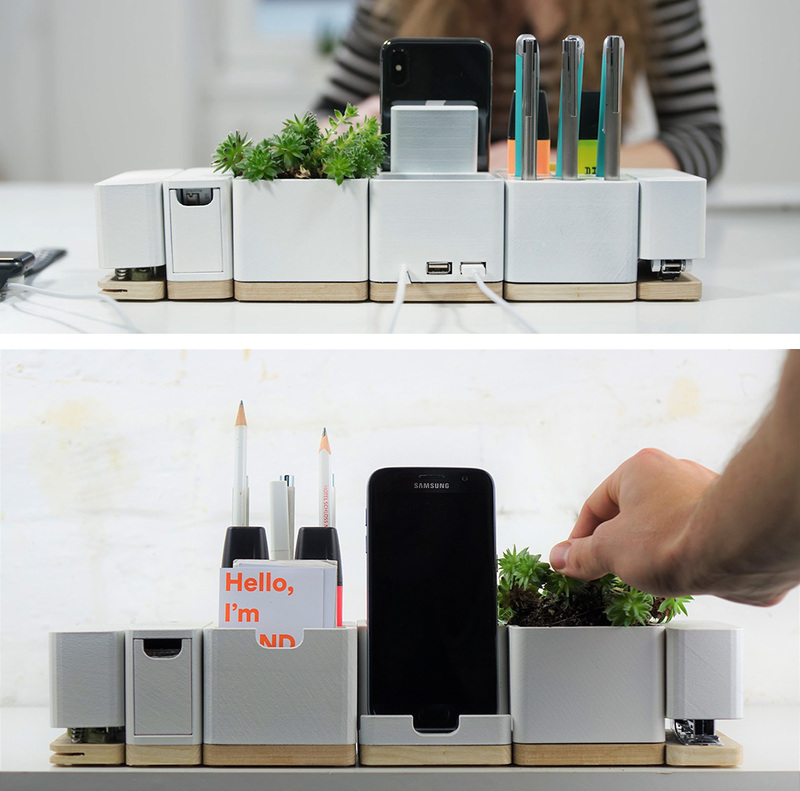 Fold has double functionality: with a simple gesture it becomes a nice desktop organizer. Keep all you need to work ready organized and ready to go to your next meeting. The easiest way to take your items with you, is with the Slim. Slim is designed to place your personal and work items, electronic accessories, and all you need to take with you to work and be productive. Twist is the little one of the family. Versatile and light, a multipurpose element that you can always carry with you to transport what you most need at hand. You can put it in a notebook, a laptop, to tie your charger cables, in a folder, even leave it fixed on the screen to always have your things at hand. A real ally in your day to day. You can use Twist to hold your earphones or cover your camera and protect your privacy. Blau is made from super resistant and high quality materials, easy to wash and dirt resistant, since they are made from anti-stain fabric. … and gray, choose the one you like the most! Click Here To Buy Now: $109 $169 (35% off). Hurry, less than 48 hours left!